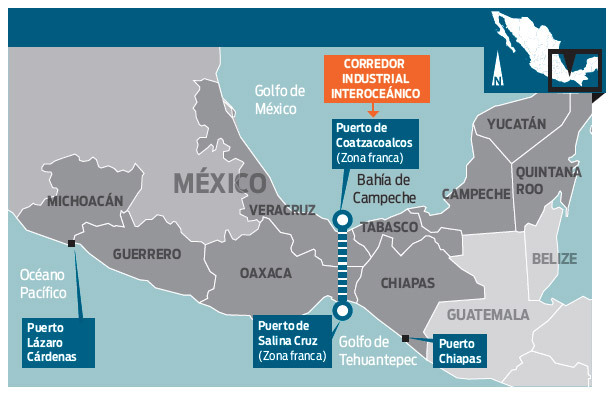 On October 29, the elected president of Mexico, Andrés Manuel López Obrador (AMLO), who will take office on December 1, announced that he will cancel the construction of the New Mexico International Airport (NAIM) in Texcoco and that, instead, it will support the project at the current military base in Santa Lucia, about 40 kilometers north of Mexico City. He made this decision after a national consultation in which more than one million people participated (a little more than 1% of the electoral register in the country): 29% of them voted to continue the Texcoco airport while 69% voted in favor of Santa Lucia. Before this announcement, President Enrique Peña Nieto announced that his government will continue with the construction of NAIM in Texcoco until the last day of his term. It is estimated that the current project has an advance of 30%. “If the decision to cancel the work continues, as of December 1, the next government will have to face the payment of commitments, which will probably require the use of fiscal resources in addition to the tax paid by airport users,” he said. . Businessmen and opposition parties to the National Regeneration Movement (MORENA) have questioned the proposal of Santa Lucia and the consultation process that they consider illegal, without binding character and only a montage or a simulation to endorse a decision already taken by AMLO. They believe that it will have a negative impact on the financial markets and that it will generate heavy economic losses. According to the Airport Group of Mexico City, it will cost the country at least 120 billion pesos. Those who did celebrate the decision were the members of the People’s Front in Defense of the Land of Atenco and the coalition Pueblos Unidos contra el Nuevo Aeropuerto who have been opposing the project in Texcoco since 2001. Before the consultation, they conducted a campaign in social networks labeled #YoPrefieroElLago, expressing that “they prefer to conserve Lake Nabor Carrillo and to avoid environmental damage, instead of continuing the NAIM, which is located in the municipalities of Atenco, Ecatepec de Morelos and Texcoco, in the State of Mexico “. On October 27, it is expected that the majority of the Migrant Caravan-Exodus will cover the Arriaga-Juchitán of Zaragoza section, leaving Chiapas to enter Oaxaca. It is estimated that there are still more than 6000 people. “Community support, from civil, grassroots and religious organizations continues to be the main source of life and hope for the people on their journey. Also, some governmental bodies and international organizations continue to follow the Exodus and greater action was observed by the Municipal Councils of Mapastepec, Pijijiapan and Tonalá, providing medical care and food”, said the Human Rights Observation and Monitoring Group in Chiapas. . In recent days, the reinforcement of immigration and police control in the border area has been confirmed. On October 26, a group of at least 150 migrants (some speak of 300, others of 450), composed of Hondurans, Salvadorans and Guatemalans, who walked from the municipality of Suchiate to Tapachula, Chiapas, to join the migrant caravan was detained by the Federal Police and personnel of the National Institute of Migration (INM). They were transferred, in trucks and vans, to the Siglo XXI migration station, located in Tapachula. At the time of the arrest, “panic spread when they were forced to get into the vans; Most people were able to flee in the bushes, but again families, children and adolescents were trapped. On this occasion, different media were witnesses and circulated videos that show the violence of the operation and the separation of children from their parents”, said the Human Rights Observation and Monitoring Group in Chiapas. For his part, the Ambassador of Honduras in Mexico, Alden Rivera Montes, said that of those who entered the first wave so far, 500 migrants have approached him to be repatriated and that 1,900 submitted their request for refuge before the Mexican Commission of Assistance for Refugees (COMAR). The Human Rights Observation and Monitoring Group in Chiapas reported that “persons and families who decided to return due to exhaustion, disinformation and the difficult environmental and institutional conditions of the exodus, are exposed to the absence of accompanying protocols for repatriation by town halls, consulates and institutions responsible for the attention to vulnerable groups, as is the case of children. This absence translates into long waits in spaces without guarantee of safety, food and health”. “Ninety-nine percent of the members of the caravan rejected the offer because it is specific to Chiapas and Oaxaca, states in a similar condition to the countries from which we come,” the organization of Peoples Without Borders told the media. The migrants have requested a meeting with Peña Nieto and his successor, Andrés Manuel Andrés López Obrador, in Mexico City where the caravan could arrive on November 2. From there, some migrants could choose to stay and work in Mexico, but several continue to pretend to reach the US. The president of this country, Donald Trump, has described the passage of the caravan as a “national emergency” and warned that he will mobilize 800 soldiers to the border along with two thousand elements of the National Guard to contain the Caravan. On September 1, President Enrique Peña Nieto (EPN) presented his sixth and final government report in the National Palace in the presence of nearly a thousand guests and his family. In his participation he affirmed that he leaves a «prosperous and stable» country, after having fulfilled «99% of his campaign proposals». “I assumed”, he said, “266 commitments during my campaign and by the end of my administration I will have completed 99 percent of them. As confirmed by the figures, this is the six-years term of employment and growth in the minimum wage. They are figures that show confidence in the country and confidence in ourselves”, he said. Certainly the country’s inflationary and economic stability has been maintained, ans its gross domestic product (GDP) has grown at rates above 2% in recent years (half of what EPN promised at the start of the six-years term). EPN began its presentation praising what was the Pact for Mexico (between the -at that time- strongest political parties in 2012) which allowed the approval of structural reforms (labor, education, telecommunications, federal taxes and energy). He spoke of a long list of “improvements” in terms of poverty. “The results of the social policy encourage us: more than two million Mexicans came out of extreme poverty and the percentages of the population in poverty are at their historic minimums. If this trend continues, Mexico will be able to eradicate extreme poverty before concluding the next decade”, he presumed. On the other hand, other sources affirm that poverty increased by two million individuals during the six-years term to end. Regarding the fight against organized crime, he stressed that a preeminent role was given to the Ministry of the Interior, and the violence has been fought with intelligence systems and the entire force of the State. “The government succeeded in reducing the operational capacity of these criminal organizations. But that same weakening led to the emergence of smaller criminal gangs, without the local police being able to respond to that challenge. I am aware that we have not achieved the goal of restoring peace and security for Mexicans in all corners of the country “, he acknowledged. According to an analysis carried out by eight journalists and coordinated by the digital newspaper Sin Embargo, EPN only complied with 49.50% of his promises. “In this failure to fulfill, not only the infrastructure works were pending but also the projects to recover the security in the Mexican geography or the construction of the national anti-corruption system. The outgoing Head of State also lost credibility and ceased to be the great character of political marketing, the one who had a word of honor, the telegenic man who managed to win the elections. The government that is about to expire achieved a historic record: the lowest percentage of approval to its political work of the last 30 years, according to all the surveys », underlined Sin Embargo. According to the report, the U.S. government has offered political and economic support for Mexico to carry out the Southern Border Program since the burgeoning number of arrivals of unaccompanied children and adolescents to the U.S. border. This support has to do with especially with activities related to border security in southern Mexico. In light of this situation, the civil organizations made nine recommendations to the U.S. and Mexican governments to address the problem. Among these is one directed at the National Institute for Migration, calling on it to strengthen internal control and to prevent violations of human rights. In parallel terms, there was a protest march against the evaluation that incorporated around 20,000 people. Using slogans like “if evaluation is necessary, it must begin with Peña,” the dissident magisterium showed the strength it still has in the state. It should be mentioned that two confrontations between teachers and police took place, with Section 22 distancing itself from these acts, claiming them to have been the work of infiltrators. 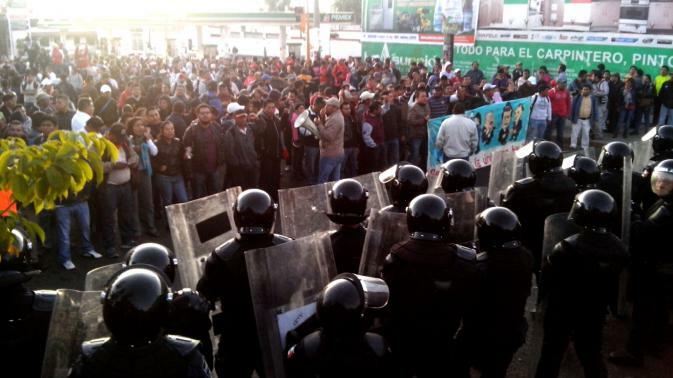 For the past six months there has been worsening persecution of the dissident teachers, incorporating actions like the deep reforms to the IEEPO, which traditionally had been managed by the CNTE, and the arrest of 4 teacher leaders from Section 22, who were transferred to a maximum-security prison in Altiplano, Mexico State. Beyond this, there still remain about thirty arrest-orders against other teachers that are still to be completed. In this way, members of Section 22 announced that they would continue with their actions in opposition to the evaluation. It also should be noted that the body of the teacher Marjorie Xolio Meléndez, from Jalapa del Marqués and an affiliate of Section 22, has recently been found. In response, residents and teachers protested before the Municipal Palace and carried out a roadblock, demanding a forthright investigation of the feminicide and punishment of those responsible. “We demand before the authorities justice for this crime, because there is more concern for saving the head and protecting Peña Nieto and the federal police behind an evaluation, rather than the truth of the people,” declared protestors. The performance evaluations have been held in all states of the Republic other than Chiapas, where it is expected that they will be carried out in the next few days. In this way, one can expect the implementation of special security operations to prevent the dissident teachers from inhibiting the evaluation as a means of blocking implementation of the educational reform. Mobilization of teachers over the death of one of them by police. 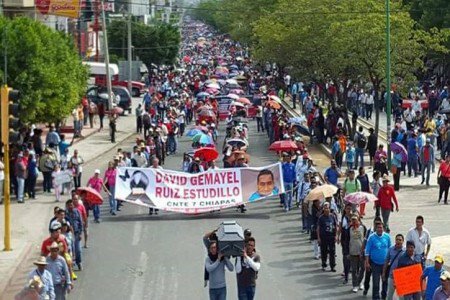 David Gemayel Ruiz Estudillo, a teacher of 23 years of age who pertained to Section 22 of the National Union of Educational Workers (SNTE), died on 8 December after having been hit by a truck during a confrontation between dissident teachers in Chiapas and police forces. Both parties held the other responsible for the death of the teacher. Since 7 December, the teachers in opposition to the performance evaluation that has been promoted by the educational reform have declared an indefinite strike. The evaluation was programmed for 12-13 December, though at the last moment the authorities delayed it until the eighth of December, in an attempt to inhibit mobilizations for boycott. In any case, teachers attempted to blockade access to the center for exams, to which teachers had been moved after having been assembled in military installations. At the center confrontations raged with the police, leaving one teacher dead, six arrested, and several others injured. During the second day of the test, on 9 December, the teachers protested in downtown Tuxtla Gutiérrez, where they kidnapped five police and appropriate hundreds of ammunition clips, gas bombs, body armor, shields, and helmets, among other items. After negotiating with federal authorities, the arrested teachers were exchanged for the police who had been held, as well as the stolen equipment. According to sources among the teachers, it is estimated that the State response involved between 10,000 and 15,000 police. Following the positive evaluation made by the National Coordination of Educational Workers (CNTE) regarding the release of their arrested comrades and the boycott of the second part of the evaluation, they suspended the sit-in they had installed in the plaza and called for the reinstatement of the 50,000 teachers who had been on strike for three days. Despite this, one of the CNTE leaders, Pedro Gómez Bamaca, warned that “in Chiapas the labor reform will not pass,” and he announced his participation in the mobilization in Mexico City planned for 18 December. In this way, the CNTE communicated that it would not allow the return to work of the 2,300 teachers who did complete the exam. The confrontations over the evaluation process in Chiapas has not been an aberration. Both the application of the exam as well as the larger educational reform have been rejected by many teachers and have involved high levels of militarization, with strong protests in Oaxaca, Guerrero, and Michoacán. It bears noting that David Gemayel Ruiz is the third teacher who has died in protests against the evaluation, following the death in February of Claudio Castillo Peña in Acapulco and the murder in March of Antonio Vivar Díaz in Tlapa de Comonfort, Guerrero.